The service began as such services do. The rabbi spoke, my two cousins delivered eulogies for their mother, and then my cousin’s wife approached the pulpit. She’s a successful editor in her forties. She wasn’t carrying any pieces of paper. She opened the cover of her iPad, slid her finger to unlock the screen, typed in her 4-digit code, and began. Her eulogy was no less heartfelt, no less moving, than those of her husband and brother-in-law. Clearly, she wasn’t using her iPad out of disrespect or lack of preparation. But amid the yarmulkes, the tears, and the Bible quote on the wall, her iPad struck me as strange. A discordant note, a note that didn’t go with what we were there for. Maybe the medium, as Marshall McLuhan famously wrote, really is the message. His idea was that while we focus on content, we tend to overlook “the change of scale or pace or pattern” that a new technology introduces, however inadvertently. An iPad, for instance, doesn’t just mean movies or tweets or e-mail; it means a changed relation to each other, by drawing much of the world closer, while pushing other parts farther away. Yet the other mourners seemed pushed no farther from their mourning. Maybe the discomfort was mine alone. Besides, we were there for a funeral, not for social criticism. Perhaps such worries, more than the use of an iPad, were inappropriate. But two months later, at my best friend’s wedding, it happened again. Reading from his iPad, the pastor began the service. When the time came for the Bible passage, the bride’s brother read Colossians 3:12-14 from his cellphone. Again, there was no change to the words themselves. Again, no one seemed to mind. And, again, maybe I was overreacting. What did I care if someone held a Bible rather than an iPad or phone? It was a Christian ceremony — not even my tradition. So why did it bother me? Maybe I was out of touch. In his day, Socrates railed against the technology of writing. He worried, as depicted by Plato in the Phaedrus, that by relying on the written word, people would “cease to exercise their memory and become forgetful,” and that they’d “be filled with the conceit of wisdom rather than real wisdom.” He wasn’t entirely wrong: We outsource memory to books (and now to devices), and we use quotations to stand in for wisdom, quotations whose larger contexts we rarely understand. But Socrates didn’t anticipate how the written word would deepen our capacity for developing ideas and narratives, or how it would deepen our connection to one another across time and culture. Maybe I was falling into a similar trap. 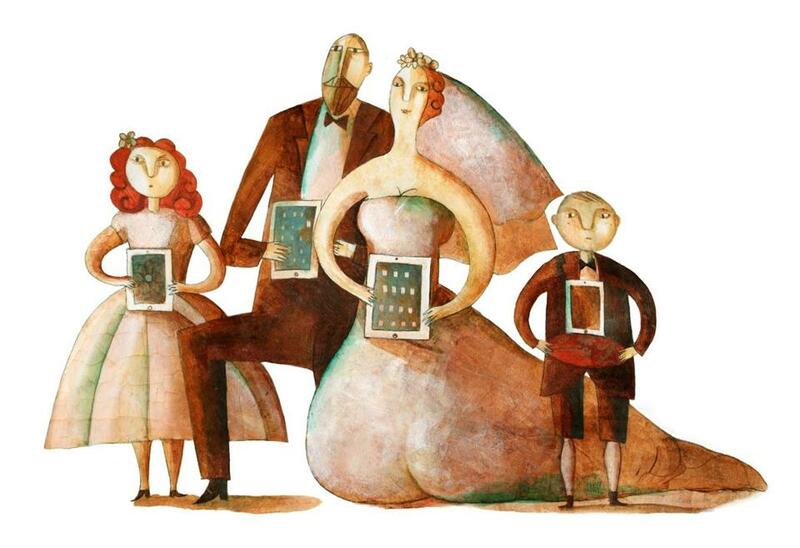 Maybe iPads at funerals and weddings make the ceremonies less ceremonious, less stuffy. Maybe they even make the ceremonies more meaningful by pulling them closer to daily life. But I don’t think so. Funerals and weddings exist not just to help us mourn and celebrate, but also to help us separate the day from the daily. We go to churches and synagogues, wear dark suits or white dresses, utter the Mourner’s Kaddish or wedding vows — all in an effort to mark the day as special, to wall out, if only for a few hours, the distractions and distractedness of daily life. We isolate the day not just to respect the dead or the betrothed, but to respect ourselves — to respect the depths of our grief, our joy, our shared vulnerability, and love. Another part of the comfort of ceremony isn’t just what it keeps out, but what it joins us to. Saying the Mourner’s Kaddish, for instance, reminds a Jew that he is part of a tradition — a religious tradition, but also a human one: Countless others have grieved. Likewise, part of the joy of hearing “to have and to hold, from this day forward, for better, for worse” is the reminder that for centuries brides and grooms have embarked upon marriage, nervous or eager, confident or terrified, from the same port. We are part of a larger tradition. We are not alone. The promise of iPads is similar. They’re supposed to link us to everything. And they do, in a way. But by linking us to everything, they link us to nothing in particular, to no defined tradition, only to a general ethos of efficiency, speed, and commerce. Which is great when we want to buy something, or tweet something, or check something on Wikipedia. But why, when trying to connect to a particular tradition, not use the media of that tradition? Why open a kind of window in the chapel for another medium, and its message, to fly in? That suit I wore to my cousin’s funeral is the only suit I have. I’m hardly a traditionalist. But I want to protect what is traditional in our culture’s few remaining ceremonies — because those ceremonies protect profound and ineffable parts of us. That, after all, is their message. What do you think? Tell us your own story about times you’ve witnessed inappropriate use of an iPad. Have you been annoyed at a wedding? A funeral? A rock concert? Your child’s school play? Submit your thoughts here. Howard Axelrod’s memoir, “The Point of Vanishing,” about the two years he lived in solitude in northern Vermont, will be released in the fall of 2015.